This week the Trump Administration gave Stephen Miller more power over the already violent and racist Department of Homeland Security. We’re going to show up loud and yiddish to say "Shande Shande Stephen Miller." 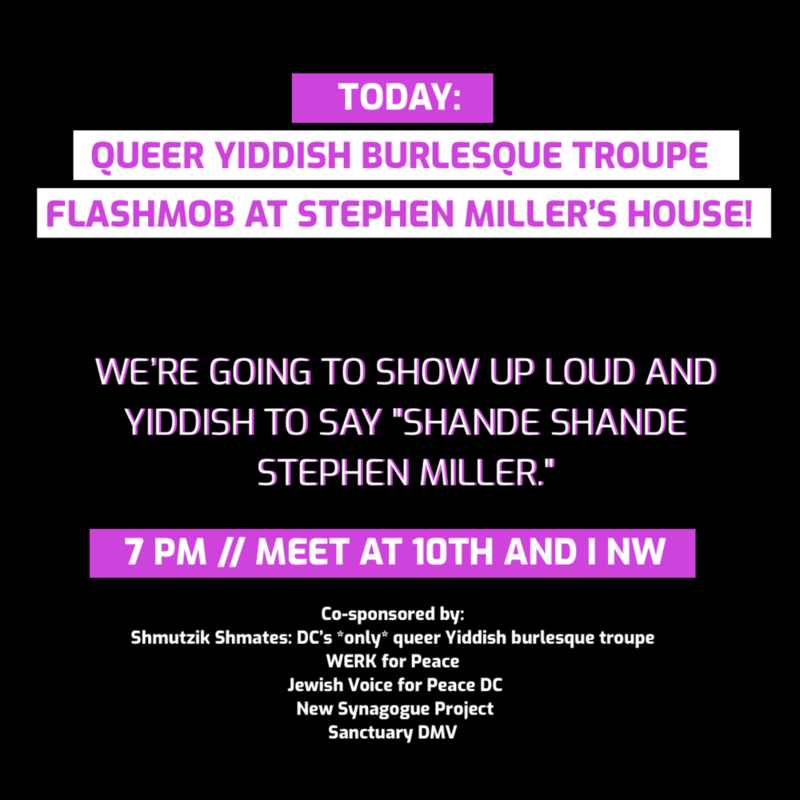 Werk for Peace + the Queer Yiddish Burlesque troupe the Shmutzik Shmates are coming together in partnership with Jewish Voice for Peace DC, the New Synagogue Project, Sanctuary DMV with an extravaganza of a flashmob outside of Stephen Miller’s house. We’re going to blast yiddish protest songs and shake out tuchus to celebrate our own roots while we shame him for his ahistorical white supremacy. We reject all attempts by Miller and his allies to deflect legitimate criticism with false claims of anti-semitism. We stand with Rep Omar in calling Stephen Miller what he is, a white nationalist who has forgotten his roots. We are coming together to say through cultural resistance to say that we will not let this go unnoticed and unmarked. Stephen Miller is a Shande. Photo Courtesy the Shmutzik Shmates.